We’re here to tell you more about why you shouldn’t put oil and grease down your drains. Go ahead, get it out of your system…yell at us for once again telling you about the dangers to your drain and sewer system. We harp on it so much you’d think we were heath teachers telling middle-schoolers about the importance of deodorant. But we’re not going to stop, because we are very interested in keeping your pipes as clean as possible so that you don’t need emergency drain cleaning and sewer services. But hey, garbage disposals and sinks are there for a reason. They’re there to pour water down, to grind the food we put in, right? So use them all you want, as long as you don’t send oil and grease down, right? Right? Unfortunately, there are some diabolical foods out there, foods that you might be sending down your drain without a second thought because the oil is so well hidden. Who are these oil ninjas? Pizza Crust: Mmmm, crispy and chewy at the same time. And if it is crispy, you have to know what that came from…oil! A lot of the oil stays in the pan at the pizza place (and that’s why we have pizza restaurant clients needing drain cleaning!) But there’s quite a bit of oil in your leftover pan pizza crust. And if there’s a bit of pepperoni left on it, it’s all the better to not grind it because of the grease. Toss it in the trash instead of gunking up your drains. Margarine: If you’re a butter user, you can skip this part. But if you use margarine, you probably forget what margarine is, exactly…vegetable oil. If you’re making french toast and some drops on the stovetop, wipe it off instead of washing it down. Mayo: Mayo, let’s see: eggs and…hey look, it’s oil again! Mayonnaise is essentially just oil with egg and a bit of flavoring. When you get some on the counter,don’t wash it off into the drain. Salad dressings: The earliest salad dressings were basically just oil and vinegar. We’re here to tell you that not much has changed. If the first ingredient isn’t high fructose corn syrup (which is pretty common) it will probably be vegetable oil. Peanut Butter: No, not peanut butter! We love peanut butter! While the oil in old-timey peanut butter is pretty obvious (the “stir before you use” kind), most inexpensive peanut butter hides its oily origins very well. The peanuts have their own oil, and palm oil is usually added for a richer flavor. Simply getting it on your fingers and trying to rinse it off proves just how oily it is. 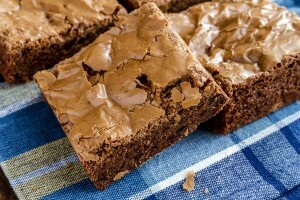 Brownies: Ghirardelli makes some of the yummiest brownies out there. And when you make them, you realize why…⅓ cup of vegetable oil. You can feel it in your mouth, but the pan you leave behind will probably have quite a bit oil. Give it a wipe before washing it. So many tasty foods, so much hidden oil. Do you best to prevent premature sewer service by doing your best to not send oil down the drain in the first place. And when you do need drain cleaning, give Garvin’s Sewer Service a call! Different Types of Pipes We Have To Know As A Drain Company What Drain Cleaning Equipment Would We Put In A Sewer Museum?